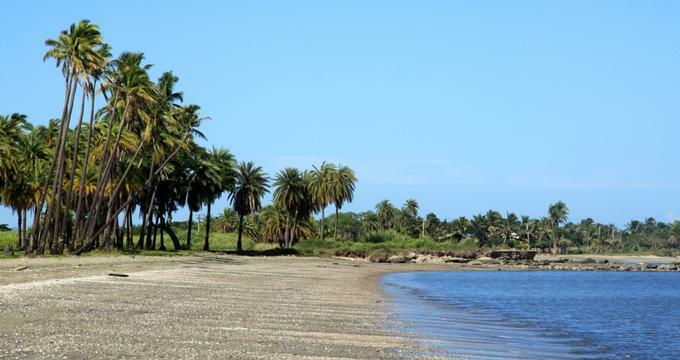 Nadi is a large city in Fiji and the weather in Nadi is the same as it is all over Fiji. It is gorgeous and temperatures stay about the same all year long. There is the chance of tropical storms during November to April. The peak season is between July and September - this is the time of year when the weather is sunny and dry; accommodations are crowded; and room rates are at their highest. There are two other short seasons that appeal to many visitors. May to June and the month of October are the best times to visit Nadi because the weather is good and there are fewer crowds. Nadi Weather in January: Sunny, tropical and beyond stunning, the gorgeous locale of Nadi, Fiji experiences beautiful warm weather in January. 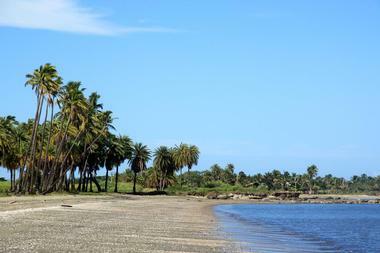 Nadi receives about 6 hours of sunshine a day alongside an average high temperature of 83°F (29°C). Low temperatures hover at an average of 76°F (24°C). February receives the most rain out of the year in Nadi with the precipitation levels at 10 inches (252 mm). The low temperature average increases by 2 degrees to 77°F (25°C) while the high temperature average increases a single degree to 84°F (29°C). In March, both the average high temperature and the average low temperature get a 2-degree bump upward to 86°F (30°C) and 79°F (26°C) respectively. April sees precipitation levels decreasing to 8 inches (204 mm) in addition to the temperatures cooling further. Low temperatures average at 77°F (25°C) while the high temperatures peak at 83°F (29°C). In May, the average high temperature sees a 1-degree decrease to 82°F (28°C). While the high temperatures cooled, the low temperatures remain exactly the same at 77°F (25°C). Nadi Weather in June: It’s a great month to grab a discount in this part of Fiji as June is one of the low seasons. The low temperature average is 76°F (24°C) while the high temperature average hovers at 81°F (27°C). July brings temperature averages that are just slightly cooler than the previous month. The average high temperature gets a 1-degree decrease to 80°F (27°C). In the meantime, the average low temperature gets a 2-degree bump down 74°F (24°C). In August, Nadi receives the highest precipitation rate annually with about 2 inches (39 mm) of rainfall to be expected. It’s also the coldest month of the year with a low temperature average of 74°F (24°C) and a high temperature average of 80°F (27°C). September sees the climate begin a steady upward climb. While the average low temperature remains the same at 74°F (23°C), the average high temperature increases by 1 degree to 81°F (27°C). In October, visitors to Nadi can catch some fantastic discounted rates during a short lean season. The weather is beautiful for the beach as well with the average low temperature at 76°F (24°C) and the average high temperature at 82°F (28°C). Nadi Weather in November: There is a moderate amount of rain in November with 4 inches (90 mm) of expected rainfall. The average high and the average low temperature create a range of 84°F (29°C) to 77°F (25°C). December is the hottest month of the year in Nadi with the high temperature average peaking at 85°F (30°C). Likewise, the average low temperature rises and peaks at 78°F (26°C). When it comes to vacationing in Fiji, it’s all about your personal preference. Since it’s a fantastic place to visit at any time of the year, some of the factors that could influence your visit are general weather, tourist volume and prices. 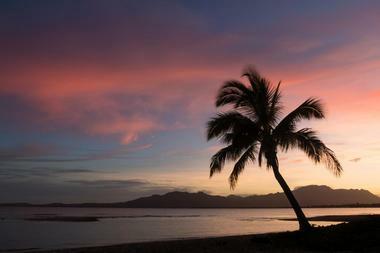 Over all, the most ideal time to hit Fiji’s beaches is between late October and early November. 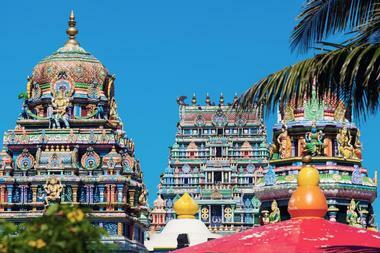 During this time, the prices are still relatively low and there is a dip in tourists. For further discounted rates, May through June is a fantastic time to come. You’ll even be able to catch the excitement of the World Music Festival. The Nadi International Airport is located several miles north of downtown Nadi. There are several ways to get from the airport into the city center. There are many local buses that frequently stop just outside of the airport: these travel along the Queens Road into the city. Some hotels offer free transfer shuttles that wait for your flight to arrive. Using a taxi is another option: just make sure that the driver turns on the meter. The Nadi Airport Shared Departure Transfer is a pre-arranged shuttle from the city to the airport. Some people arrive by boat at Port Denarau: the boat companies provide free transfers between the port and Nadi hotels. There are several ways to get around Nadi and the surrounding areas. You can rent scooters by the day. There is a bus service that operates between Nadi and Suva. Tthe buses also continue around the island via Lautuka, Ba, and Rakiraki. Local buses also run between Nadi and New Town Beach stopping all along Queens Road. Buses operated by West Bus Transport travel between the Nadi bus station and Denarau Island. Along Queen’s Road you can find a variety of buses that run to different areas around and outside of Nadi. In addition to taxis, there are also many companies that offer vehicles and private drivers. 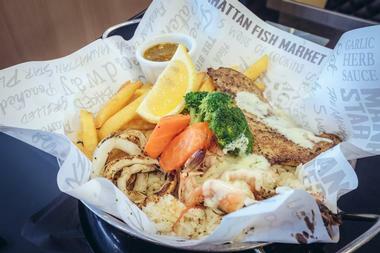 Nadi offers a wide variety of restaurants and other kinds of eateries. Several restaurants serve fusion cuisine such as The Food Hub, Taste Fiji, and Tu’s Place. There are several good Indian restaurants including Sitar and Tata’s. Other ethnic cuisines include Chinese food served at both Bo Hai Seafood Restaurant and at Small Plates; Italian food served at Mama’s Pizza and at Wishbone and Pizza-king; Japanese food served at Daikoku; and international food served at Bulaccino and Hemisphere Wine Bar, the Corner Cafe, and the Bounty Bar and Restaurant. 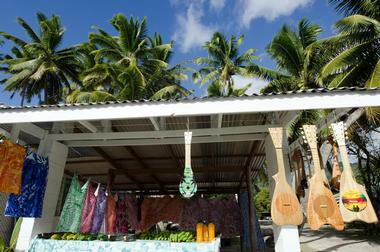 Nadi’s market offers fresh local produce such as fruits and vegetables. Negotiating prices is considered to be impolite when dealing with Fijian merchants - their stores usually have fixed prices. But this is not the case with Indo-Fijian merchants in their small shops -they will start at a high price; you counter with a low price; and eventually you agree on a price. If you don’t enjoy negotiating and haggling, stick to the big stores such as Jack’s of Fiji: this is the largest merchant on Fiji. Other stores include Prouds and Tapoo. 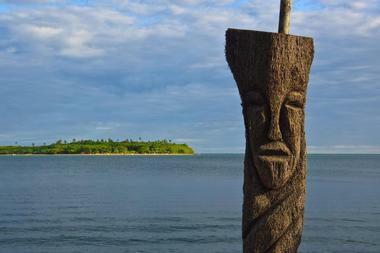 Near Nadi is Port Denarau located on Denarau Island: this is where cruise ships dock. It is a shopping mecca with a mall, a surf shop, and much more. Nadi is a popular place for a wedding because of its year-round pleasant climate and because of its natural beauty. Foreigners can get married in Fiji: you need to apply for a marriage license at the Registry Office and find a local celebrant to officiate your marriage. 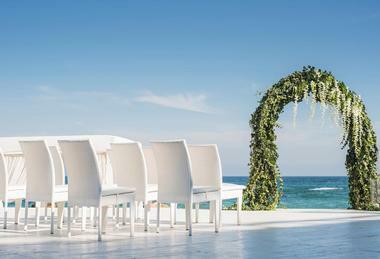 After finishing your paperwork it’s time to find your perfect wedding venue. The Sofitel Fiji Resort and Spa is a popular venue: it sits on the sugar-white beach of Denarau Island surrounded by warm waters and palm trees. Other hotel venues include the Sheraton Resort and the Intercontinental Fiji Golf Resort and Spa. The Nadi Event Centre is a new venue located near the airport.